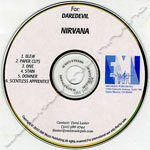 notes official submission 6-track promotional CD-R for the motion picture 'Daredevil', featuring the tracks Blew, Paper Cuts, Dive, Stain, Downer and Scentless Apprentice. None of the songs were included, inlieu of submissions by Moby, Fuel and others. Custom stickered disc and back tracklisting insert.